We are proud to be working to support Guardians of the Arches with the New Economics Foundation. 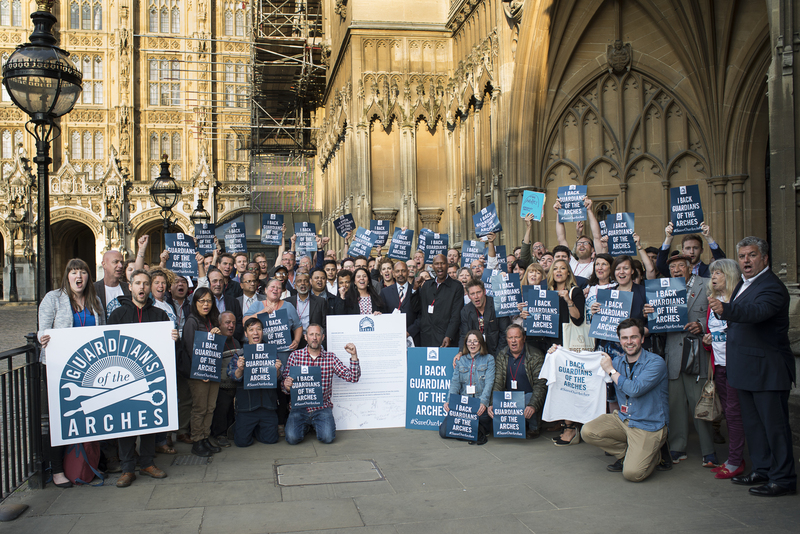 We organised the Save Our Arches campaign event on the 12th June at Parliament, the seat of national power. Tenants from across the country came together to put their case against Network Rail’s planned sale of its arches this summer. The campaign has won the backing of 20 parliamentarians from across the political spectrum including Jeremy Corbyn MP, Rebecca Long Bailey MP, Baroness Bakewell of Hardington Mandeville, Ian Mearns MP, Zac Goldsmith MP and Lord John Bird. After hearing the passionate and emotional stories of tenants and seeing the packed room, parliamentarians each pledged support for this important campaign. 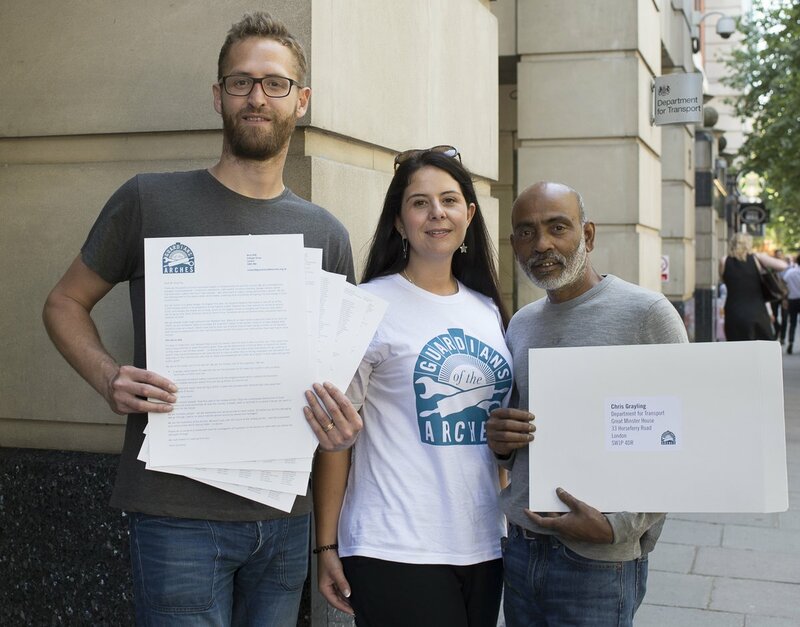 Last week three of our members who are also Network Rail tenants and actively involved in the work of Guardians of the Arches, handed in the letter requesting a meeting with Chris Grayling – Secretary of State for Transport. The letter is now signed by more than 7,000 people. EETG members Matt Lovell from Our London Vodka, Leni Jones from Rosso Corse and Mohammed Moonan from Tyreworld Trading hand in Guardians of the Arches letter to Chris Grayling at the Department for Transport. Photograph by Sarah Ainslie. 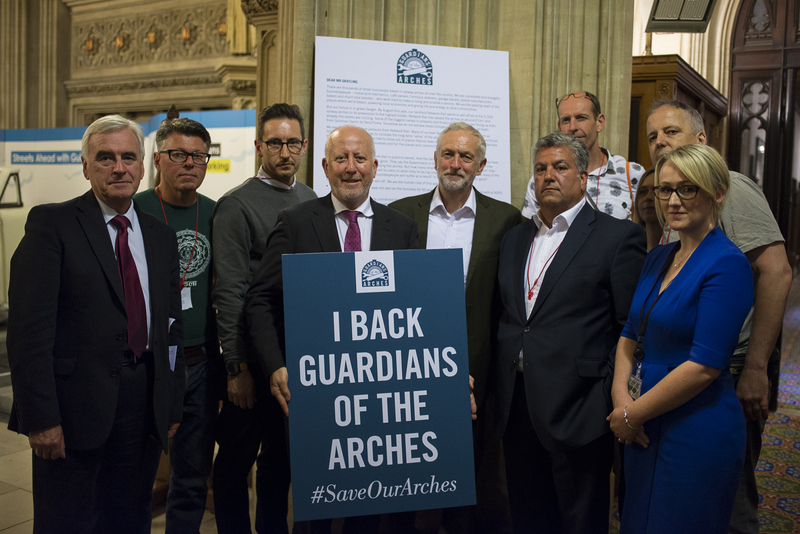 In an exciting turn of events in the House of Commons last week, Ian Mearns – MP for Gateshead secured a commitment from Jo Johnson – Minister of State for Transport to meet with Guardians of the Arches! Stay posted for what happens next. This national work compliments and aids our own Affordable Workspace Manifesto by building a national network of small businesses that we can work with in solidarity both now and in the future. Missed this in the press? Here’s what’s been happening in The Guardian, The Times , Sky News and the Hackney Gazette. The Economy Committee scrutinises the work of the Mayor relating to economic development, wealth creation, social development, culture, sport and tourism in London, including the Mayor’s role as chair of the London Economic Action Partnership (LEAP). 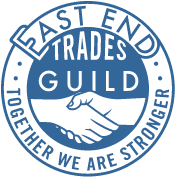 The committee is currently researching how to better support micro businesses in London and wanted to talk with our members about their experiences. 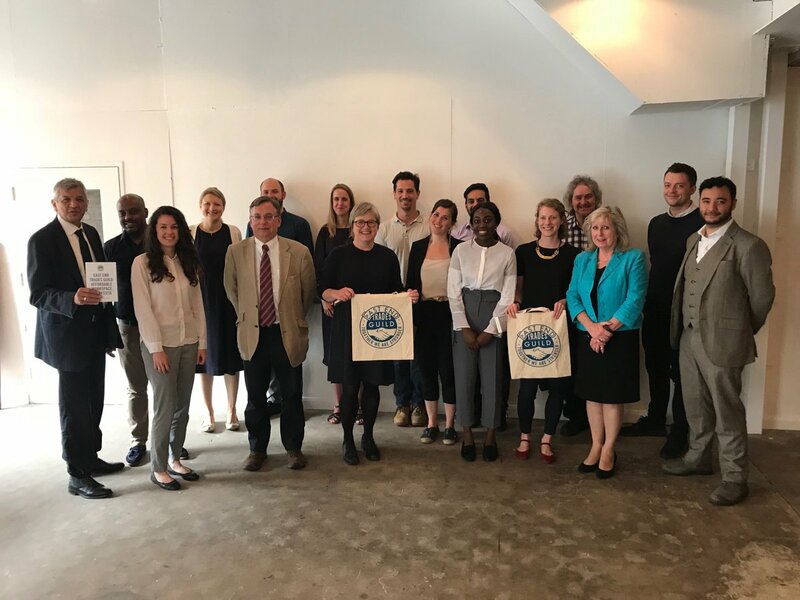 We brought micro business owners together representing retail, services, manufacturing and industry, tech and social enterprises to discuss the issues and challenges they face and informed the committee of our Affordable Workspace Manifesto. Left to right: Clare McCammont – Ince Umbrella’s, Richard Salmon – Nwes, Vicky Clarke – Growth and Economic Development LBTH, John Biggs – Mayor LBTH, Councillor Motin Uz-Zaman – Cabinet Member for Work and Economic Growth LBTH, Lee Sargent – Calverts Coop, Qusai Jafferji – Newmans Stationery and Charlene Mullen from Charlene Mullen. 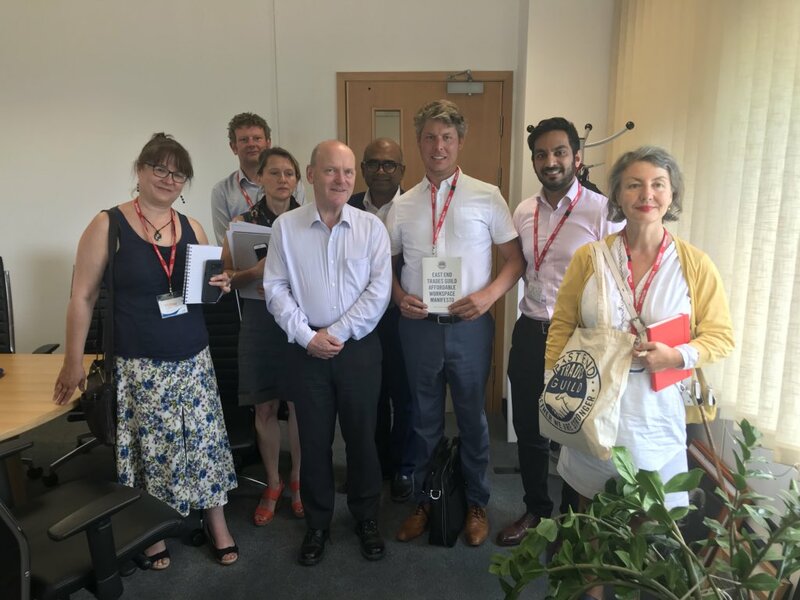 Last week we met with John Biggs and his team to discuss how best to further his commitments to work with us on our Affordable Workspace Manifesto. It’s the first time since his re-election that we have met with the Mayor. Mr Biggs agreed to support all the proposals in our Affordable Workspace Manifesto at an event in March just prior to the local elections. We struggled to fit in all four proposals in just one hour but we managed and will be following up on more focused meetings for each section. You can read our manifesto here. Over the next year we will be focusing on bringing our Manifesto to life and will be holding ourselves to account on this crucial task as well as local politicians. Our Director and Founding Organiser Krissie Nicolson made an appearance on the Weekly Economics Podcast today with Will Brett from the New Economics Foundation. She calls for bold intervention from central government on business rates and rents. You can listen to it here.